You recently may have noticed changes in your Multi-Function Device (MFD) and desktop printer and the way we print documents in offices across American University. While the changes may seem as relatively insignificant as swiping your card on the new office printer before getting your copies, they are, in fact, quite significant. In an effort to better manage the university’s printing needs and to address usage, paper consumption, and related expenses, the Procurements and Contracts (PCD) department recently initiated a Managed Print Program. The initiative is designed to decrease printing costs significantly, standardize and upgrade the university’s existing printing equipment, improve document and data security, and reduce overall paper usage with more efficient and effective printing options. To achieve these goals, the university entered into a five-year contract with print management vendor Centric to replace all MFDs that were being leased from Canon, Xerox, and Konica with Sharp MFDs. Centric also now manages and supports all networked desktop printers and provides toner and on-site troubleshooting services. The benefits of this move to a single vendor – as opposed to the previous three – include centralized billing from approximately 3,000 invoices to just 12 per year, reduced administrative effort, improved ability to track printing expenses, and guaranteed response for service-related issues within four hours. Addressing cost, the initiative is projected to yield an average savings for MFD leases of up to 70 percent. Cost per impression (per single copy) savings ranges between 10 and 50 percent. Over the span of five years, the consolidation efforts are expected to save the university at least $5 million. Those savings will be distributed back to the departments through their lease and copy cost reductions. The initiative also enables the university to lessen its carbon footprint, as it results in a reduction of electricity and paper usage. To date, 530 desktop printers have been removed in favor of shared printers accessible to everyone in the respective offices, and an additional 300 or more printers will be decommissioned in the near future. “In addition to yielding a significant reduction in overall printing costs for the university, the Managed Print Program also bolsters our sustainability efforts, decreases administrative efforts, and allows us to implement new technology. It is a win-win initiative for the university,” said Laura McAndrew, Assistant Vice President of Treasury, Office of Finance. For more information about the Manage Print Initiative or if you would like to decommission a desktop printer in your office, contact pcd@american.edu or the helpdesk. AU produced more than 20 million pages of paper annually – stacked on top of each other, that would be approximately 7,880 feet high or equivalent to five Empire State Buildings. $194,000 spent on toner annually. 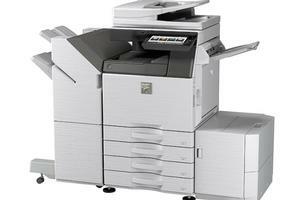 More than 150 individual copier leases resulting in almost 2,500 invoices and hundreds of maintenance and service invoices. 220 multifunction printers (MFDs) (floor-standing, networked copier that copies, prints, scans, and faxes documents), including more than 41 unique models from three different manufacturers. Use of eight different desktop printer manufacturers and almost 74 unique printer models.